"The fungus alone is sufficient to recreate all the pathology diagnostic for the disease," says David Blehert, a microbiologist at the National Wildlife Health Center in Madison, Wisconsin, and senior author on the report. Blehert and his colleagues collected healthy little brown bats (Myotis lucifugus) from Wisconsin, which is well beyond the known range of white-nose syndrome. They infected the bats by direct administration of G. destructans spores to the skin or by contact with infected bats from New York. By the end of the 102-day experiment, the tell-tale white fungus was growing on the muzzles and wings of all of the directly infected Wisconsin bats and 16 of the 18 exposed to sick bats. This is the first experimental evidence that white-nose syndrome can be passed from bat to bat, and is very worrying from a conservation point of view because bats huddle together in large numbers in caves and mate in large swarms, says Emma Teeling, a bat biologist at University College Dublin in Ireland. "If a bat has this fungus on them, it's going to spread quickly throughout the population," says Teeling, who was not involved with the study. "It's like a perfect storm." The infected Wisconsin bats did not die during the experiment, which may be due to the limited timeline of infection, the authors suggest. 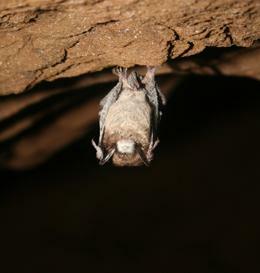 Although the study does not directly show that a healthy bat will die from infection with G. destructans, the results did show that the fungus alone was sufficient to cause lesions diagnostic of white-nose syndrome to form on previously healthy bats, indicating that the fungus is the cause of the deaths so often associated with white-nose syndrome in the wild. Since it first appeared, white-nose syndrome has behaved like a novel pathogen spreading from a single origin through a naive population, says Jonathan Sleeman, director of the National Wildlife Health Center, who was not involved in the study. Proof that G. destructans is the primary cause of white-nose syndrome will "help us focus our actions or management efforts into the future", he says. Although little can be done to control the spread of the disease through bat-to-bat transmission, the US Fish and Wildlife Service (FWS) has asked people to stay out of caves in and near affected areas, and has closed some caves on agency-managed land. On 21 October, the FWS announced that up to $1 million in fundingwill be made available for research on white-nose syndrome. Projects covering topics such as how the fungus proliferates within caves and mines, and the potential for biological means or environmental manipulations to improve bat survival, are among the service's top priorities. Lorch, J. M. et al. Nature doi:10.1038/nature10590 (2011).